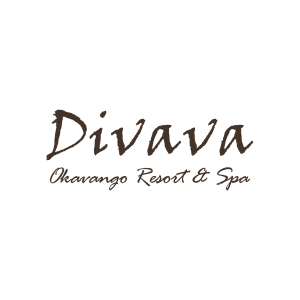 Divava Okavango Lodge and Spa is set on the banks of the Okavango River and is built in and amongst the trees overlooking the river. A few hundred metres from Popa Falls. Locals refer to it as Paradishu Ghomumbiru or Little Paradise. The lodge has a restaurant; bar; guest lounge; viewing deck overlooking the river; laundry service and internet connection. The lodge provides a hot or cold breakfast; a light lunch and set five-course dinner. The lodge also has its own spa, the Mystique Spa. The swimming pool is located right next to the sauna and steam rooms with a view of the river, there are also two round open treatment rooms which include a bath treatment therapy. Accommodation at the lodge includes 20 luxury chalets which are all equipped with en-suite bathrooms with both indoor and outdoor showers, a bath, double sinks and separate toilet; air-conditioning; telephone; room service; mini-bar/fridge; mosquito nets; tea/coffee station; in-room safe; hair-dryer; bathrobes/towels; complementary soaps, shampoos and shower caps. Wildlife in the area include buffalo; sable and roan antelope; bushbuck; reedbuck and tsessebe. Activities include excursions to Mahango National Park and Bwabwata National Park; cultural visits; popa falls; boat safaris; sun-downer cruises; fishing and more.